The Fun Show is a wonderful learning experience available to all Paso Fino horse owners and riders regardless of your skill level. An affordable or free, way to participate, improve your showing skills and enjoy the company of other Paso Fino Owners. The entry fee a Fun show is FREE to all Southern Regional Members. This year the Extravaganza Show of Southern Regional PFHA is introducing a new theme, "Cosa Caliente", which translates in acceptable Spanish slang to,"Hot Stuff". This is our largest and most elaborate show and we want all members to feels that they are participating, whether they are showing, observing or volunteering. Once again, we need volunteers for decorating, SR booth maintenance , passing out ribbons, errands, ect. Contact Prissy (386)467-3779, email: prissyfilly@aol.com, if you would like to sign up for a time slot in the SR booth or the ribbons booth. Darby (352)245-5887 or jacksonwulff@aol.com for all other areas. Just call , we'll find a spot for you. Prissy will be at the June 15th meeting with a sign-up sheet so come with your pencils. Southern Regional will be sponsoring a raffle to JLM's Jaranero........2001 Internation Champion, Ponce, PR and 2001 Grand National Champion Fino Stallion....Many thanks to Barb Perich of Fantasy Paso Finos for donating this breeding. Cost of tickets are $2/each or 15 for $20. Raffle tickets will be available at the Southern Regional Booth at the May Day Show at OEC in Ocala on May 4 and 5, 2002. Drawing to be held on Sunday, August 4 at Extravaganza Show in Ocala. was a big success. Many members and new members attended and stated it was the most fun they've had with their horses. Pole Bending..Barrel Racing...Easter Egg Race..Keyhole..Relay Races...were among the games played. The next Fun Show will be the "Halloween" show. It will be a non-pointed show with a "COSTUME CONTEST"
You will need to bring Lawn chairs and Lunch, Current negative coggins, buckets for water, helmets for children under 12. (We suggest everyone wear a helmet) and riding shoes with heels. The next newletter will have more info for this fun show. let me know what you think!!!!! Lorelie Kendziora, at 622-2109, to renew. We are opening the Show Committee to any new members interesting in working with a really motivated and fun group of people. You are cordially invited to come share your ideas and participate in presenting Southern Regional Paso Fino Horse Shows! Southern Regional is sponsoring a two-day clinic by Carlos Tobon at Fiddleleaf Farms, on Saturday August 31st and Sunday Sept. 1st. This man gives an awesome clinic. For information on cost for auditing or bringing a equine, contact Darby at (352)245-5887 or jacksonwulff@aol.com. Thanks to all, who managed time from their busy scheduled, to attend our June trail ride. We did not have a big turn out but the ride was wonderful. During the ride we encountered a fawn on the trail, that wasn't more than 20 minuntes old. I'm sure we scared the mother away because she was no where to be seen. The poor fawn was scared to death but no more than my darn horse who thought the little thing was a big bad monster. We manage to get past the fawn without incident and continue. The woods were teaming with wildlife and our next sight was of a Bobcat, streaking across the underbrush. You would think that was enough for one day but once again we encounter animals, this time a herd of deer bounded out , into the road, in front of our group. A member of our gang, who chooses to remain anyomous, showed us how not to do a quick dismount from a spinning horse. The ride was held in Valhalla, the weather was wonderful (and we only encoutered one horsefly). 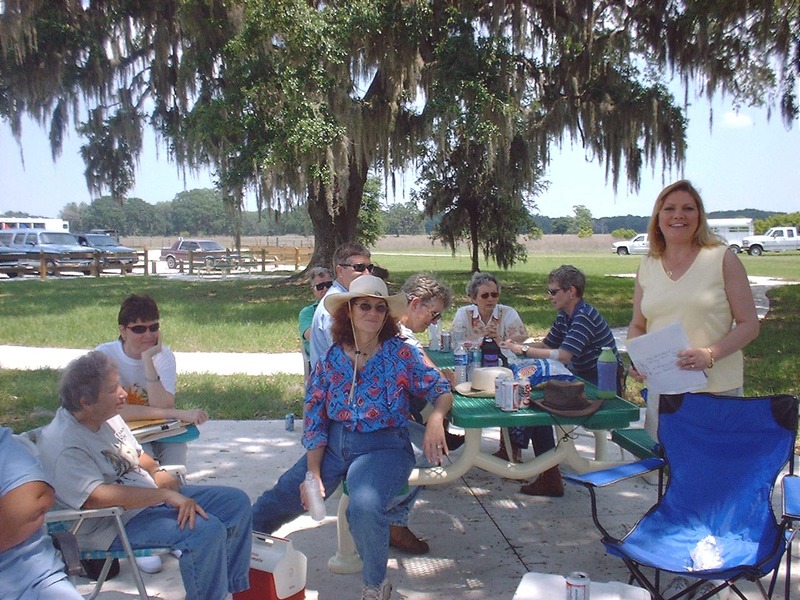 On the return to the trailhead we had lunch under the oaks and enjoyed each other company. FYI: I did return to the trail later that day to insure mama did not desert the fawn because of our intrusion. I was relieve to see, she and her baby went looking for a more private home. PS: A very big thanks to Celeste Gavin and Polly for working so hard on clearing and marking the trails. When you see them remember to let them know how much you appreciate their efforts. SRPFHA is supporting our Youth by including new classes to our shows this year. Youth Horsemanhip andSilver Medal Equitation Classes(under 18). Also new this year is the Pleasure Novice Class(non-pointed). 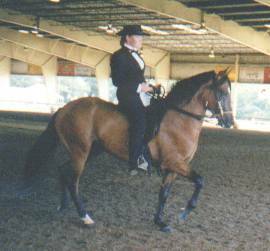 We added this class to encourage and help our Fun Show Participants to enter the show ring. This class presently is free to all over 18. Get a group together for our August Show Extravaganza. This class will be on Sunday and again is free to all who enter. 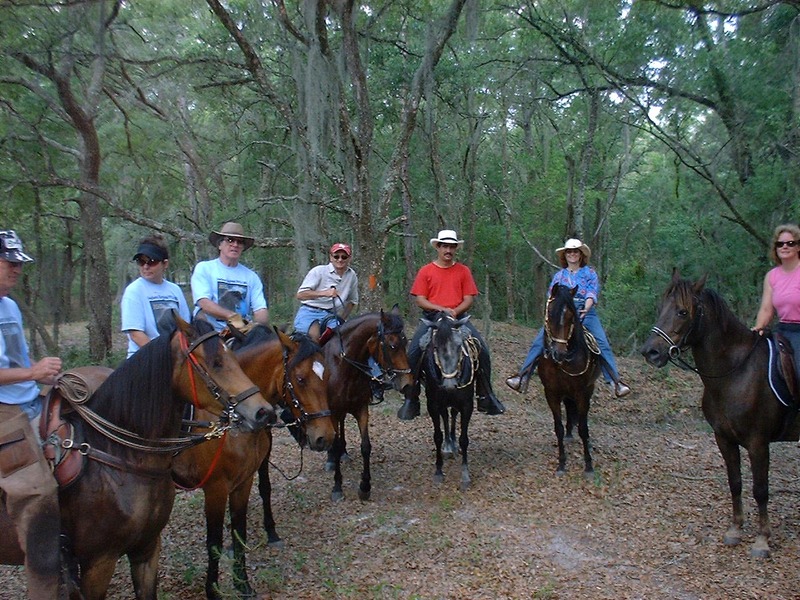 If you are interested in sponsoring a Paso trail ride call Richard Raymond at (352)465-3876.